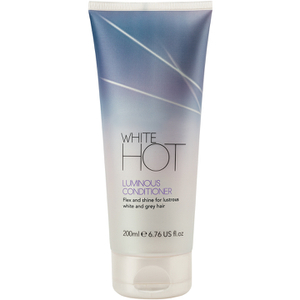 Replenish and hydrate with the Luminous Conditioner from White Hot; a brand that cater specifically for natural grey and white hair. Fortified with Keravis™, the rich, creamy formula works to nourish and strengthen individual strands, whilst White Truffle locks in moisture and restores luminous shine. Expect smooth, healthy-looking locks with a glossy finish and added bounce. Squeeze out any excess water after shampooing and smooth through damp hair to the ends, then rinse thoroughly. Aqua (Water), Cetearyl Alcohol, Dimethiconol, Cetyl Alcohol, Cetrimonium Chloride, Mica, Quaternium-91, Parfum (Fragrance), Cetrimonium Methosulfate, Behentrimonium Chloride, Phenoxyethanol, Hydroxypropyl Guar Hydroxypropyltrimonium Chloride, Glycerin, Isopropyl Alcohol, Dodecylbenzenesulphonic Acid, Disodium EDTA, Citric Acid, Disodium Distyrylbiphenyl Disulfonate, Hydrolyzed Vegetable Protein PG-Propyl Silanetriol, Alpha-Isomethylionone, Tuber Aestivum Extract, Benzyl Alcohol, Sodium Benzoate, Limonene, Citronellol, Potassium Sorbate, Magnesium Nitrate, Methylchloroisothiazolinone, Magnesium Chloride, Methylisothiazolinone, CI 77891.